Do you want incredible shine and tint from henna? But without too much fuss – do a henna gloss. You do use henna for henna gloss, but it’s used in lesser quantities than you would use in a traditional henna. Gloss refers to the conditioning and moisturising ingredients such as yogurt, egg, coconut milk or any natural conditioner. You can use whichever your hair likes. I have been shying away from henna for the mess it creates and how effortful the whole procedure is. But ever since my discovery of henna gloss – a few months ago – I am a gloss addict. I like how easy it is to apply and rinse as compared to usual henna-ing. It adds fantastic copper-red shimmer to my hair. Plus what I like about the henna gloss is it makes my fine hair look thicker, fuller and bouncier. Besides, if you have been wanting to put henna and are apprehensive about its outcome, I encourage you to try henna gloss. It can be your first step into the mystic world of natural colours. Conditions hair: henna + conditioner equals fab. Peps up your natural hair colour and creates a vibrant shine. Henna coats the hair shaft, giving it more body and making it visibly fuller. Tames flyaways and makes hair softer, smoother and healthier. To do a basic gloss, you will need just 4 ingredients listed below. You can also add one or more hair nourishing herbs to suit your hair’s need. 2. Cover the bowl and let it sit for 15 to 60 minutes for dye release (you can also leave it overnight). The longer you let it sit, the stronger the henna will be – which means you will get darker colour results. For those with lighter hair or wanting less colour effect, 15 to 20 minutes should be enough. 3. Next, add the glossing ingredient. My favourite glossing ingredient is egg – I use two eggs for my mid-length hair. I also add shikakai powder, brahmi powder and almond oil* to the henna paste, and mix everything really well. *If I have already applied oil to my hair I don’t add extra oil to the henna paste. 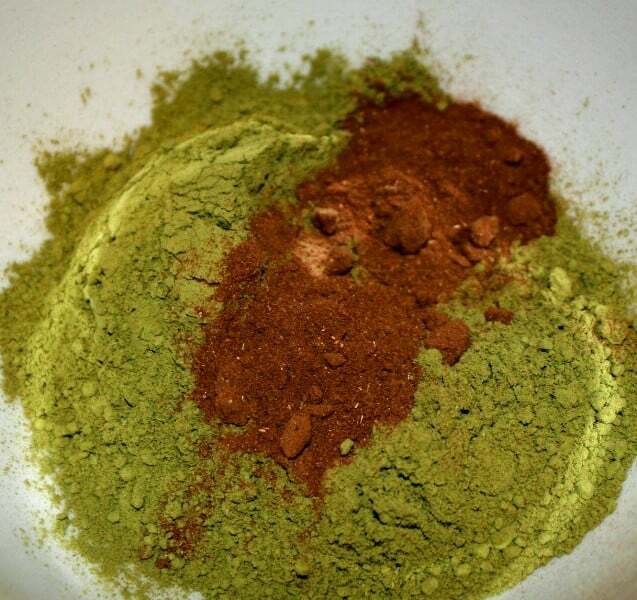 Tip: If you are using dry powders such as shikakai, brahmi, etc mix them with water before adding to the henna paste. This will create a smoother creamier gloss. 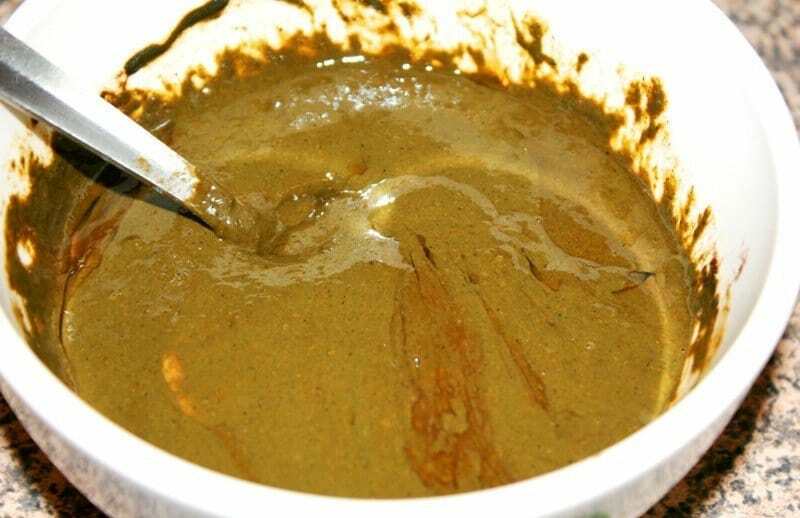 After the dye release, add the eggs, shikakai, and brahmi powder to the henna paste. 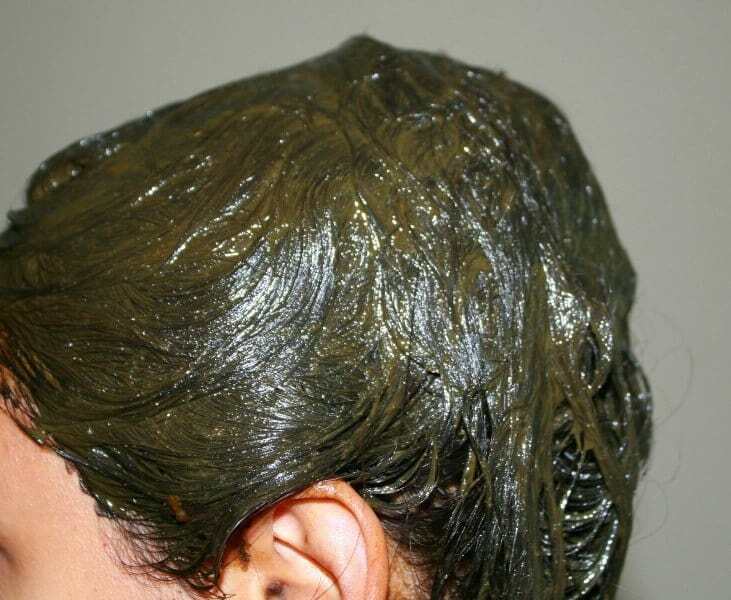 I lightly oil my hair before applying henna gloss mix. This is because henna can be drying, especially in winter months, and use of oil will prevent hair from drying out. I also comb my hair – this makes it easy to apply and doesn’t create tangles. Apply the mixture in sections – cover every bit of your scalp and hair for the most benefit. The henna gloss mixture has a bit of ‘slip’ to it, so it is easier to apply than regular henna paste. I apply the henna mix with my hands. And I don’t wear any gloves. I just put some oil to my hands and they hardly stain. But if you don’t want to take a chance, use gloves (especially if you have added indigo or walnut powder). Once your head is completely covered with the henna gloss, put on a plastic cap, or you can also use an old scarf (I have a scarf dedicated for henna). Clean any drips off your face, hands and neck to prevent staining. For a very subtle red sheen, leave the henna gloss on for a short time – 15-20 minutes. For a stronger red, leave the gloss on for 45 to 60 minutes. I leave mine on for 20 to 30 minutes and it gives my hair beautiful shine with a tint of copper-red. Then wash your hair as normal. If you have dry hair, you may want to skip washing it. Instead, use a DIY hair rinse (marshmallow or licorice ) to cleanse the henna residues and it lifts your hair to another level. Or you can also co-wash using a natural conditioner. Note: Henna oxidises, so it takes 2-3 days for true shade to set in. My hair gets a beautiful copper to reddish tint which is more visible in direct light. But aside from appearance, every time I do a henna gloss my hair feels so soft and bouncy. And the shine is incredible. I am a fan of henna gloss! 3. I love adding shikakai and brahmi powder to the henna paste. You can also try other herbs listed above. If you have dry hair go for marshmallow root powder – it is a superb detangler, hair softener and skin soother. Licorice root powder is another good herb for dry hair and irritated scalp conditions. 4. 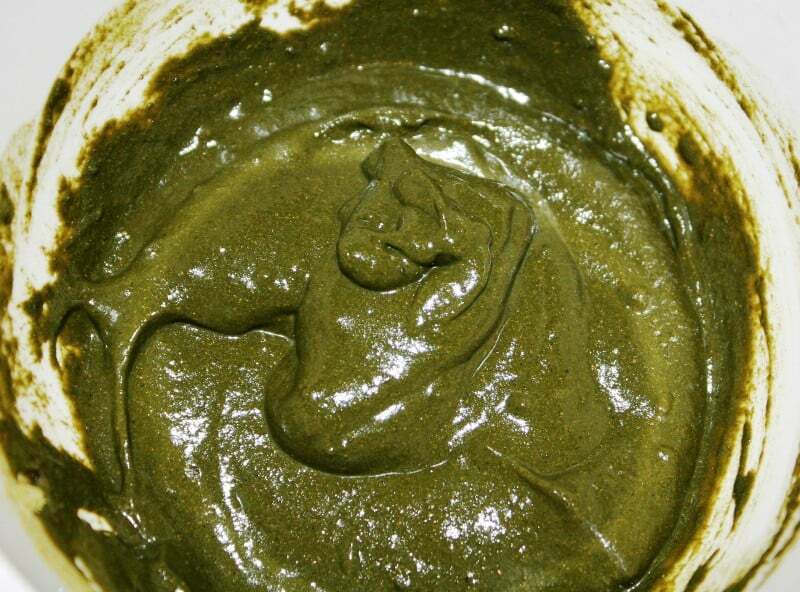 For an extra boost, use green tea instead of plain water to make the henna paste. 5. Create a Darker look: If you don’t want the reddish tint that henna often gives you, you can try to add other ingredients to your henna paste to get the desired shade. Henna, when mixed with other botanicals such as black tea and indigo, can create a variety of beautiful shades of red and brown. if you desire less intense colour, use black tea or coffee to make the henna paste. Both help to tone down red tones, deepens brown tones and cover greys. you can also use herbs such as: nettles, cloves, sage, or walnut hull to create a darker look. With the dried herbs, make strong infusions, strain, and use instead of the water. 6. Lighter/Blonde hair: If you want a lighter look and with all the benefits of henna – use cassia obovota. Also called as neutral henna, it gives hair golden highlights over time especially for light coloured hair. For enhanced colour effects use chamomile tea to make the cassia paste. To create strawberry hair tones combine cassia with true henna (use 25% henna and 75% cassia). Always buy 100% pure henna – it should be stated by the seller. Otherwise henna can be mixed with synthetic dyes, metallic salts or ammonia, which is not good for your hair. Hi Minaz, I have thin and fine coily hair, I usually do henna treatment, at first I had a set back with itchy scalp. I kept doing the henna, my hair start getting longer and nicer, my Greys are like mahogany beautiful, my problems it’s that I have alot of knots making me having more breakage and losing the length. Please advise. Hi Sandy, try adding some fenugreek powder or coconut milk to the henna. I am 38 yrs old with some greys have never dyed my hair before.I just bought godrej nupur henna to cover my greys.Its a combination of 10 herbs – Henna,Brahmi, Shikakai, Aloe Vera, Methi, Bhringraj, Amla, Neem, Hibiscus and Jatamansi.Please suggest a good conditioning and a hair dye mask recipe with this.I have slightly wavy and dry shoulder length hair. I heard of a recipe – Dry roast few cloves and powder them.Soak 4 tbsp nupur henna powder,little instant coffee powder,little clove powder in luke warm tea decoction in an iron vessel overnight.In the morning add curds and an egg and mix well.Apply, leave for 4 hours and wash with water. Is this the right way to do it? Yes go ahead, it sounds great. I have a tiny suggestion, add 1tbsp fenugreek powder when making henna paste. Let me know how it works for you. Thanks for your suggestion will try and let you know. I am not sure where I went wrong but the henna mask did not dye my greys, It did condition the hair. This is what I did – I dry roasted a tbsp of cloves and powdered them with a tbsp of fenugreek seeds and mixed with 6 tbsp nupur henna powder, juice of 1 lime and soaked overnight in luke warm tea -coffee decoction in an iron vessel overnight.ln the morning I added a cup of curds, 2 tbsp olive oil and got busy.Later I added an egg and applied to oiled hair in sections.Left it for 4 hours and washed with luke warm water. Please suggest what I can do to dye the hair. Hi Gugsi, henna doesn’t smell bad, its quite fragrant and like you said it has earthy and herb-y smell. Also, good quality henna is little slimy when soaked with water/tea. Hi Minaz, i have waist length dark brown hair. What should i mix with pure henna to get rich burgundy color? Hi Rashi, try beetroot tea. Dear Minaz I use henna for my hair and I learn lots of things from your blog.thank you for your articles.I need some information about neem powder? Neem powder can dye hair like cassia obovata? Is it true? I tried but it didnt work. Thank you. Hi Minaz, This was a super great article. I use to henna my hair twice a month when I first went natural, however, it was so time consuming that I stopped. I remembered how strong, long and healthy my hair was when I was consistent with it. I have plenty of herbs and plan on doing it again. Can you freeze extra henna gloss to use at another time? Also, what store bought conditioner is a great conditioner to use if I want to do a quick henna gloss? If I sleep in it overnight will it give my hair better coverage and finally, can you do a henna gloss treatment every week followed by a deep moisturizing conditioner in order to cover grays? What is your natural hair colour. Will this henna gloss recipe deposit colour on natural black Indian hair. My hair natural colour is mix of black and dark brown. Henna gloss will give beautiful red/brown tint to Indian hair. Hi Gugsi, apply on dry unwashed oily hair. Hi Minaz! Thank you. How often do you do this treatment? Hi Gugsi, I do it every 2-3 weeks. Thank you so much for your clear instructions on how to make Henna Gloss. I learned about it originally from YouTube, but there are so many variations, I was getting frustrated. Your instructions are so clear and informative. I am so glad to know you find this useful. Love. I love henna and have been using it for years. I do not like the red colour it leaves on my hair (I am African with black curly hair). To combat this i use the 2 step method with Indigo. Can i use the 2 step method with a henna gloss instead of the longer henna process? Hi Temi, yes you give it a try. Let me know how it works for you. I have a small doubt.. My hair is of mid length and is soft but kind of dry with no shine and split ends and has many tangles… i want to know what should be added in the Henna Gloss pack so that i can get a soft silky smooth moisturised hair with no tangles and split ends…. one more thing do we need to shampoo wash after rinsing out the henna or wait for like 24hrs?? You can add coconut milk and/or egg yolk. Shampoo lightly after rinsing out. Hello! Just tried the henna gloss recipe without the oil and added some apple cider vinegar and oh my is my hair a fiery red now! If you don’t want your hair to change colour too much the oil might be pretty important. Don’t know if the tablespoons of apple cider vinegar made a big difference as amla isn’t already acidic. I let the henna do its colour release for 30 mins and then applied it for 2 hours. I absolutely adore it but it is the same effect as when I have hennaed my hair in the past without the amla and egg. I also use a similar kind of mix to get a gloss. What i do is use the yoghurt as base , add 2-3 tablespoons of extra virgin olive oil, a tablespoon of coffee, grate 2 fresh amlas,squeeze an entire lemon ,some fenugreek seeds and a little green tea extract to it. I let it stay overnight and apply it next morning. Please let me know if i am doing it right. Also, i am facing real huge hair loss issues.My hair volume has reduced to a quarter in a year and all my tresses have become frizzy . I just want to grow better darker and thicker hair. I checked online for castor oil.Can i be assured of better results? And yeah, i have very sparse eyebrows ,like literally, nill. Is there even a slightest possibility that i can grow them? Please help me out!! Hi Neha, don’t add coffee and lemon juice. Add egg and yogurt just before applying. Yes you do head massage with coconut oil mixed with castor oil (go for cold pressed ones). Do you have any vitamin deficiency? iron, vitamin D, b12? Have you had your thyroid checked? One of the symptoms of hypothyroidism is loss of the outer portion of eybrows and hair thinning. Good luck! Lightly oil before applying. When making henna paste add amla powder and fenugreek powder, leave it over night. Just before applying add coconut milk, it will make your hair beautifully soft. Hi there. I simply love Henna. Henna=HappyHair<3 My hair never feels dry after henna because i keep it wrapped in clingwrap plastic to keep the henna moist. Its easier to rinse out and my hair thanks me for it. After rinsing with warm water I condition only. Then do a cleanse 3days later. I henna once a month sometimes twice. I do what works for me as I have tried many methods found online and researched constantly. I mix my henna with acv and then freshly boiled water. The gloss i also do my own way by mixing with oil and conditioner. Hi HarleyQuinn, Glad to know that your hair loves henna. I have never mixed henna with acv, should give it a try. What oils do you use? any specific? Thanks for sharing what works for you as it will benefit many other. Can you use the consumable organic amla powder to use with henna on her. Thank you. Hi Sumy, yes you can. how long does it last …could I use this instead full head of henna. Is there a build up in color or is this ment to be used in between after you dyed your outgrowth? Hi Moonrise, may be cassia didn’t suit you. What is your like – dry or oily? Try massaging your scalp with or without oil. That should help. I forgot to add that I used the cassia obovata in place of coloured henna (I have dark brown hair and am not interested in altering the colour). I love your blog and have learnt so much. I tried this gloss recipe (I followed the directions exactly) but it did not work out for me. It did not wash out, once my hair ‘dried’ it was incredibly oily. And to make matters worse I lost a LOT of hair. I was horrified to say the least. Please give me suggestions how I can make my hair healthy again after this mishap. Great post! I am also something of a henna gloss addict. I love the way my hair responds (moisture, strength), but I do get some relaxing of my curls from the henna. That said, I do prepare my henna mixture the night before for maximum dye release and leave the gloss on for about 6 hours to get good color coverage on my white hairs. Next time I am going to add is the almond oil to see if I also get the softness and still get good color, too. I am also going to do a little experiment with adding a little neem because my skin (and scalp) love it. Thanks Nia. Do let us know how neem and almond oil work for you. henna is just great and godmade ! I tried it this weekend, Its awesome.. My hair are super shiny and bouncier! I added some fenugreek seeds paste..I am not sure how it helped me, but I thought it’s good for hair conditioning. How often should we do this mask? That’s awesome Tejashri. You can do it once or twice a month. I have been wanting to try henna… this seems like a good start. Thanks. Thanks. Do let us know how it goes.